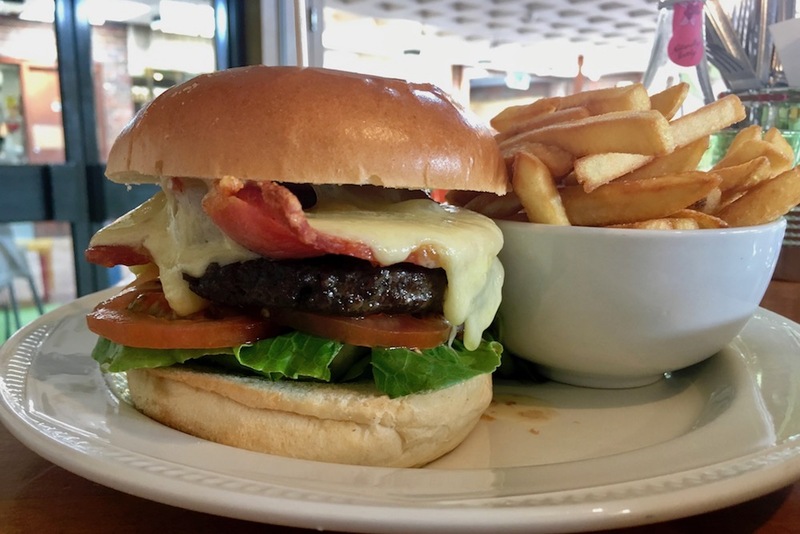 The café at Guildford Cathedral has upped its game thanks to new owners who have spruced it up and introduced a new menu. 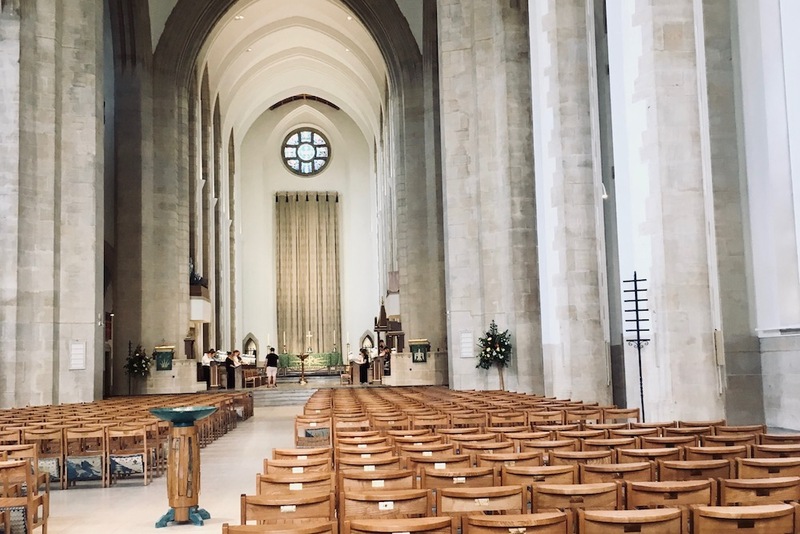 Just outside Guildford town centre sitting high on Stag Hill you’ll find Guildford Cathedral – the modern cathedral that took 30 years to build (the Second World War didn’t help) and was consecrated in only 1961. From the outside, the cathedral looks austere and almost unwelcoming but once you step inside it’s a mesmerising blend of modern-day gothic architecture and glorious beauty. 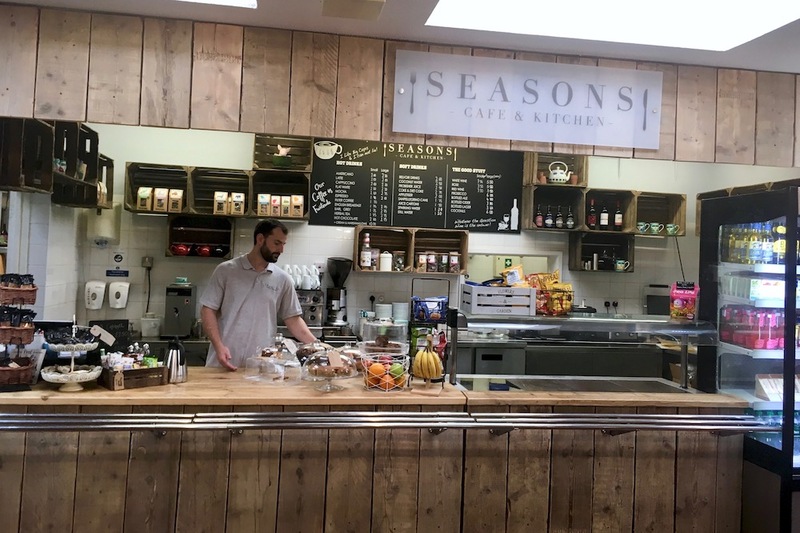 In the refectory – within the Cathedral grounds – is the Seasons Café and Kitchen, run by the cool cats behind The Tipsy Pigs private catering company. 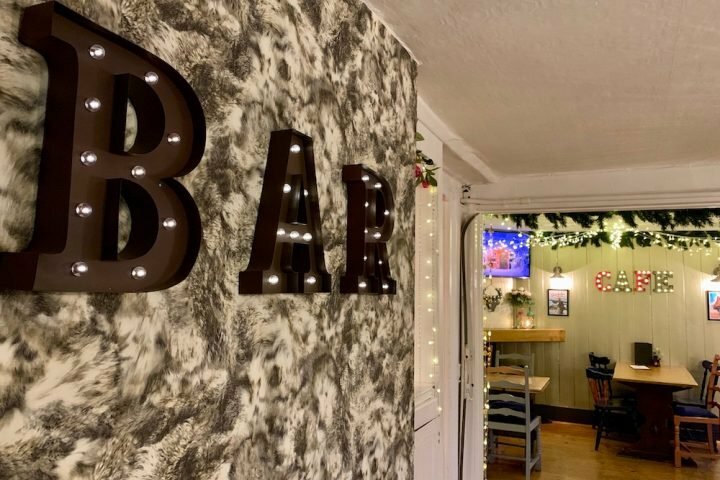 The café here was taken over by The Tipsy Pigs team late last year and follows the success of the Seasons Café and Kitchen at The Lightbox in Woking. By night the space is a unique event space, available for hire for weddings, private parties or corporate functions. There’s no escaping the fact that you’re essentially in a church hall – the space is enormous and the vaulted ceiling probably adds to the sense of space. 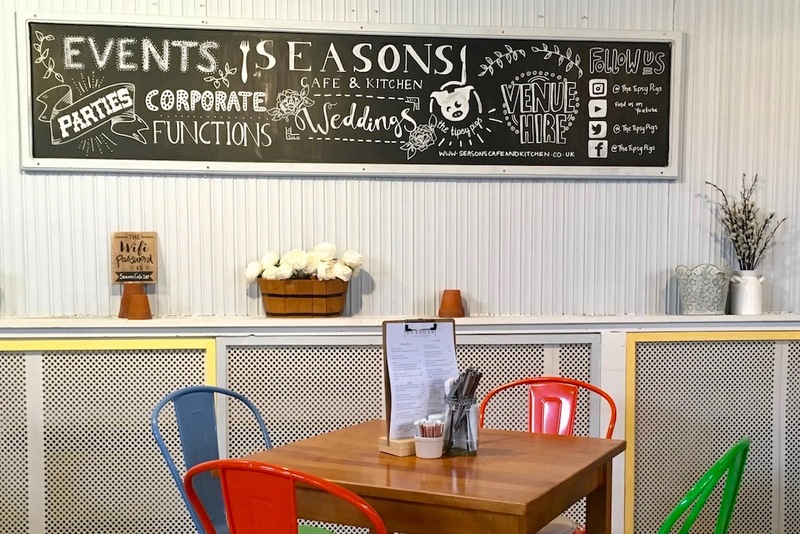 But it’s a majestic space and, like the cafe in Woking, the Refectory café has been given a makeover with a new serving area, comfy sofas, colourful seating, coffee tables and a children’s play corner. On the Friday afternoon that I popped in for lunch it was pleasantly busy, but not ridiculously so. I’m told that coaches visiting the Cathedral stop off here for lunch so it can get quite bustling. 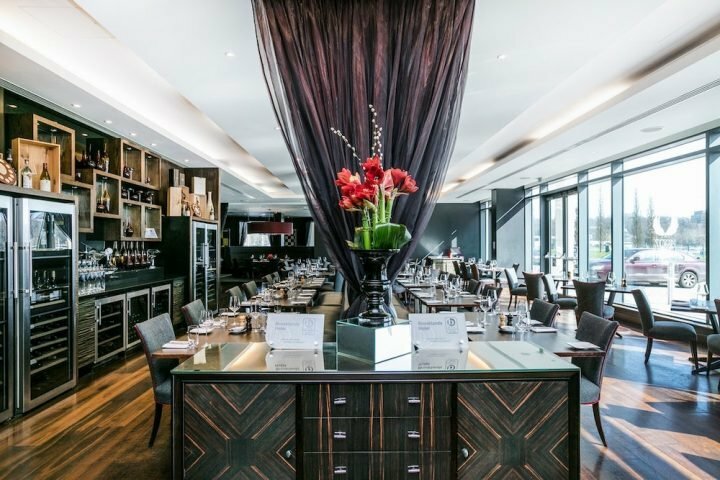 The chef is Carla Williams, one of the Tipsy Pigs trio, and the menu here mirrors that of the Seasons Café at Woking. 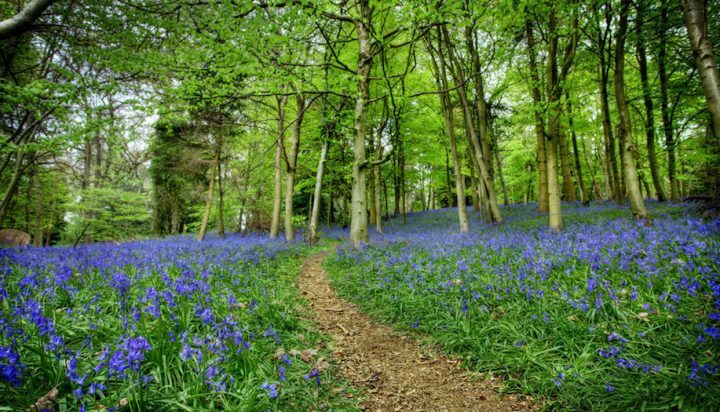 Carla was previously the manager at Sands at Bleak House in Woking for 10 years. 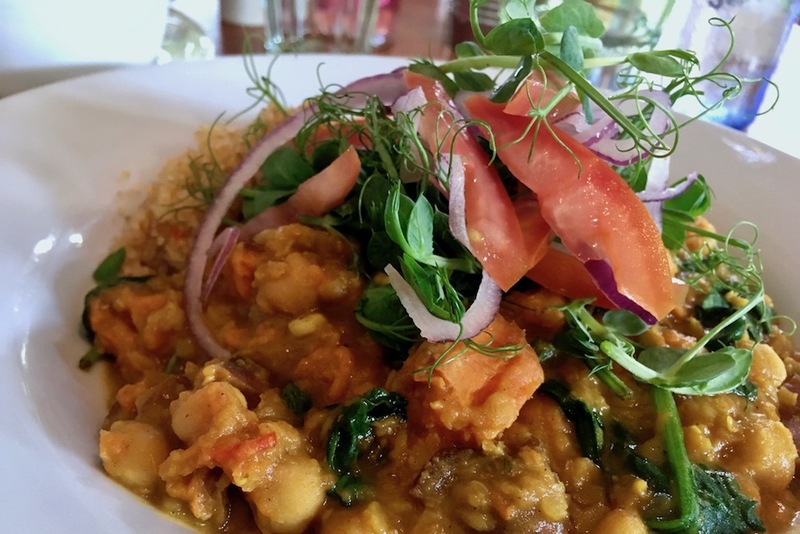 Like Woking, the food is excellent – and there are plenty of choices from café classics like jacket potatoes and soup of the to more substantial mains like cod fishcakes, burgers and curry. There are also lighter bites like salads, and avocado and poached egg on toast. I went for the sweet potato curry and my daughter ordered the burger, and both hit the spot perfectly. The selection of sweet treats is nothing short of splendid, and well, it would be rude not to, wouldn’t it. So of course I did, ordering a chocolate muffin and a millionaires shortbread – each one to share with my daughter. The huge space and makes this a brilliant place to come if you have push chairs or prams. It would be a brilliant place for an NCT or baby group meet up. And if you’ve got older kids they’ll be happily entertained in the kiddies’ play area. Well of course, it’s Guildford Cathedral – and if you’ve never been inside I’d totally suggest you do. It’s free to get in, and if you time it right the choir may be rehearsing which is lovely. The staff a really friendly and helpful, and there are also tours. Good for: girly brunches or lunches, cake-munchers, culture vultures who need a bite, mums with kids and pushchairs and families. Not for: If you’re looking for somewhere cosy, this ain’t your place. Also those looking for posh nosh, might want to look elsewhere. The damage: This is great value for the quality of food you’re getting. Mains are £8.50-£11; soups, wraps and jacket potatoes are £5.50.